When I was younger, I used to love turning to different props and methods that could give me a yes or no answer (I’m very indecisive). Magic eight balls were my jam, and I always played “eeny, meeny, miny, moe” to choose between various options. Stuff like that. The adult, more wellness-y and official version of these things? Pendulums. Once I heard about these contraptions, I had to get my hands on one and find out how to use a pendulum so that I could resolve my biggest (and most mundane) quandaries. It’s not something you should use to help make every single decision of your life—but it can be useful in certain situations. According to Patel, it’s a very personal practice. “A pendulum can be used in various scenarios where you just want to gain a little more clarity, connection, and a better understanding of something,” she says. “You can ask the pendulum questions about life, love, health, career, money—whether simple or complex.” So I wouldn’t exactly turn to a pendulum to help you decide on what to have for dinner (although… technically, you could). As stated above, you can feel free to consult your pendulum whenever you feel the need, but think of it as more of a spiritual practice. “I recommend using it as much as you feel you need to or want to—just like any other spiritual practice, it’s a personal preference,” says Patel. “You can use the pendulum to help you with any problem, troubling situation, or something you need more clarity around.” Just remember: The pendulum can only answer “yes” or “no” questions. “So make sure to phrase questions in a way that can allow you to get a clear answer,” she says. 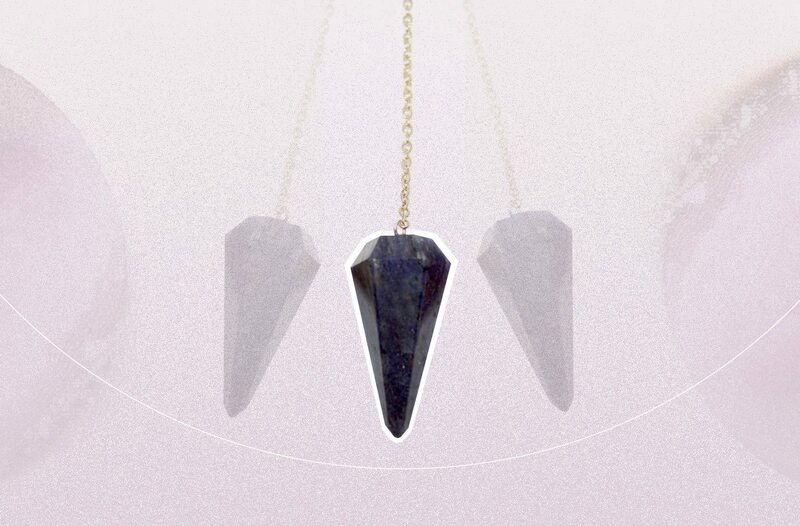 To get your go-to pendulum, it’s kind of like when you walk into a gemstone shop and find what speaks to you. “Choosing the right pendulum is like choosing the right crystal—there is no right or wrong,” explains Patel. “Trust your intuition and allow yourself to be shown which pendulum is right for you. When you pick up a pendulum, how does it feel? Focus on the feeling, and you will know which one is meant to be yours.” If you’re into jade crystals, for instance, and you see a jade pendulum, go for it. After you’ve used your intuition to pick out the pendulum that’s perfect for you, you’re ready to consult the tool for guidance. These are Patel’s pro-approved tips for actually using it. 1. Cleanse: As with crystals, pendulums need cleansing too. “Cleanse the pendulum with sage, outside under a full moon, soaking it in sea salt if the material or crystal is water and salt friendly, or simply by holding it under cold tap water,” instructs Patel. 2. Prepare your mind and energy: “It’s key to learn what is ‘yes’ and what is ‘no,’” says Patel of what to do before asking the pendulum a question. AKA—you have to figure out how it will speak to you. “Take a moment to find a comfortable seat and quiet your mind. Take a few deep cleansing breaths to open up and clear your mind, body, and spirit. Holding the pendulum in your dominant hand with the chain or top link between your thumb and index finger, ask ‘show me yes’ and ‘show me no,’ or ‘what does yes look like’ and ‘what does no look like.’” When you do this, Patel points out that the pendulum will either swing vertically, horizontally, or in circular motions. Take note as to what each answer looks like—for instance, if it went up and down vertically when you said ‘show me yes,’ that is how it will respond in an affirmative way to your question. “You could also ask ‘show me neutral’ if you want that option too,” says Patel. 6. Remain open: Using a pendulum is all about being at ease. “Just like when you are going through a meditation, try to simply allow the pendulum to communicate freely with you,” says Patel. “The more open you are to receive, the easier you and the pendulum can communicate. And remember, like any practice, you can enjoy the experience and trust in your ability to connect because you already have your own answers.” It’s just a tool, BTW, that’s merely there to help you get closer to your own intuition. You have your own inner truth, after all. If you’re looking for more healing energy inspo, here’s how to get rid of negative energy that’s attached to you. And this is the prayer to say when saging your house for better energy, according to shamans.